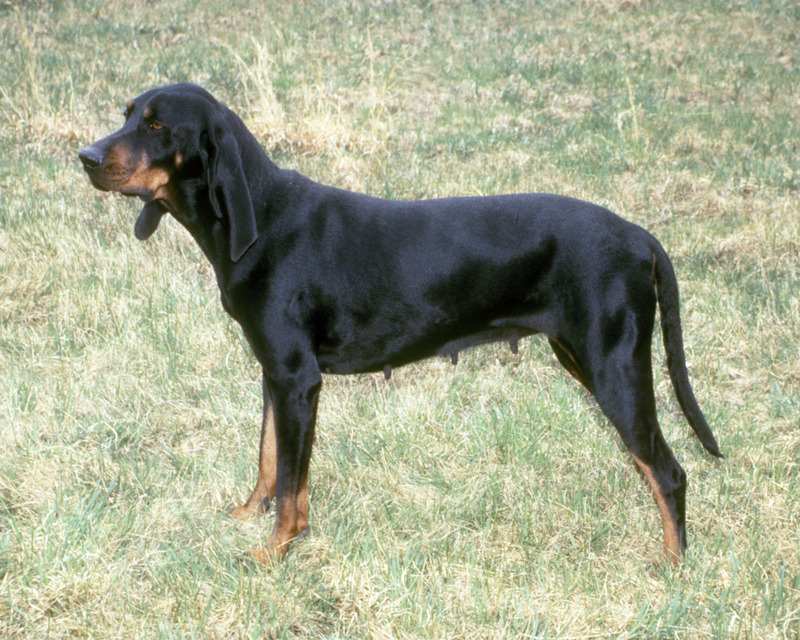 The Black and Tan Coonhound is a gentle giant and large hunting dog. They carry a black, spotty tan and oily coat. They are usually covered in rich black hair with a tan trim. Sporadically they will have white hair on their chest. They are commonly mistaken for Rottweilers. Since they are generally used as hunting dogs they do give off a muscular and athletic physique. They should have short to medium toes, depending on their body size. On average males can weigh anywhere from 50-75 pounds and females 40-65 pounds. Coonhounds have distinct facial appearances. Usually their eyes can range from hazel to brown, with elongated ears, and sensitive snout. They have wrinkled jowls, black noses, drooping ears, with a helpless expression on its face. These dogs are slobbers, so be prepared to clean and mop sticky messes. It’s just something that comes with all the other great characteristics of this animal. They have an eager and alert expression, which makes them adorable. As they are on the hunt or playing they run and walk with graceful strides. They are an athletic dog that have a build of strength, speed and mobility. Their coat should be short in length but thick enough to defend itself away from prey or smaller “game”. These dogs will occasionally shed. Diligent care is needed when tending to their appearance. They can develop a “doggy order”. Their coat will shed and stick to carpet and upholstery. Brushing them one to two times a week will assist with this. They will shed all year long. Because of their ability to shed and to develop a “doggy smell”, frequent bathing would be helpful. Before taking them hunting you want to shampoo them with non-deep smelling detergents or fragrances. To decrease teeth decay, bad breath, and tarter issues brushing teeth weekly will be helpful. They will have issues with ear infections if not properly taking care of. Their drop ears refrain from letting air to circulate. This will cause harmful bacteria to build up. Bathe them as needed (hunting purpose). Over bathing can cause allergic reactions and irritation. To care for these dogs sensitive bodies you must do several things. To hydrate and moisturize the body of these dogs, spray them with Aloe Hydrating Spray, mainly during winter months. Consistently give them by-weekly full baths and sneak a quick bath weekly. To clean their eyes use Optisoothe Eye Wash. It will wash away any leftover shampoo and keep away any infections or allergies that may come up. Clean their ears monthly, if issues come up weekly is ok if there are any consistent problems. If you need assistance make sure to consult your vetenerian, especially if you don’t feel confident cleaning inside their ears, which are delicate. Black and Tan Coonhound dogs are very lovable. They sometimes think that they lapdogs despite their big size and stature. As puppies they are friendly with children, though as they get older they can get less playful. The Coonhound is a very mellow, calm, cool and collective dog. Because of their hunting instincts and strong independent demeanor they can lose interest in playing with kids and can become standoffish with people they don’t know. It would be a good idea to keep them away from non-canine pets also. At a young age, it is important to mix these dogs with others if planning on having a multi-family dog or working pairs. The male Coonhound can be overly aggressive to other dogs if not neutered. This is advisable unless you intend to breed them. They are probably not the best guard dogs. These dogs can be very loving and caring toward its owners and people around them. They are quick to make friends. Though, they must be socially trained at a young age because they may develop introverted tendencies as they mature and get to an elder age. The Coonhound is also a great exercise buddy, mainly during running or jogging sessions. While you’re getting your “steps in”, your exercise buddy will be getting a few sniffs in just to keep up the strength in its snout. More so, they can be couch buddies. These dogs do like to relax after a long day. 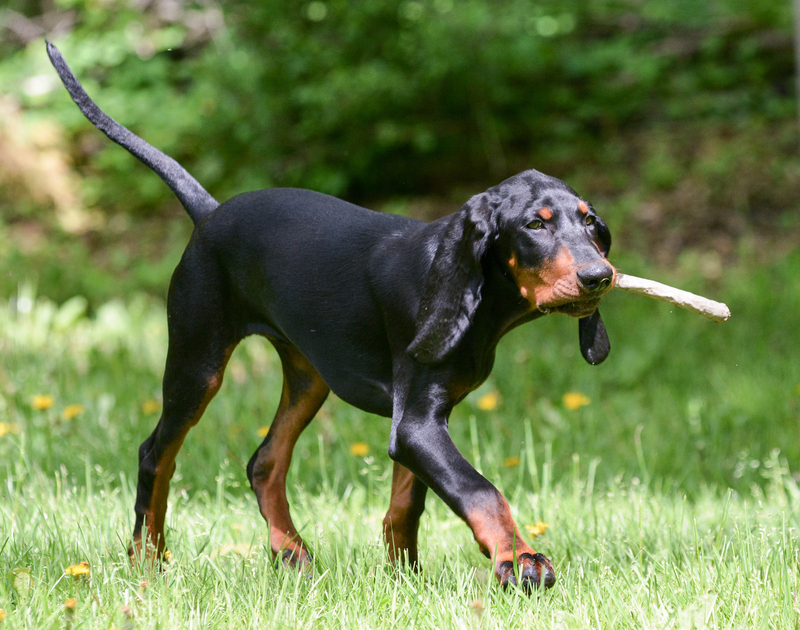 Black and Tan Coonhound dogs are very sociable dogs. They are friendly with in a crowd, though can be distracted by a nearby and attractive scent. Better to partner dogs up when using domestically. Make sure to have them in close proximity while in the process of training. They will wonder off if they catch a scent, which can cause issues if they track a scent for hours into the night. They have a talent to bark with a deep throated sound, when they’re in alert mode. This makes them a good watch dog. The Coonhounds size alone could scare off “would be” intruders or strangers. But they are all bark with no bite. With their keen sense of smell and awareness, it makes them great for hunting. With their drooping ears and sense of smell allows them to be good trackers. To assist hunters Coonhounds have a specific bay or “bugle”. This lets their owner know what kind of activity they are on, such as finding a different and distinct scent, finding a trail and targeting the prey for a hunter. Coonhounds are nocturnal dogs that can assist owners with hunting opossums and bears. Seen more as a hunting dog, but can be trained as a family dog. 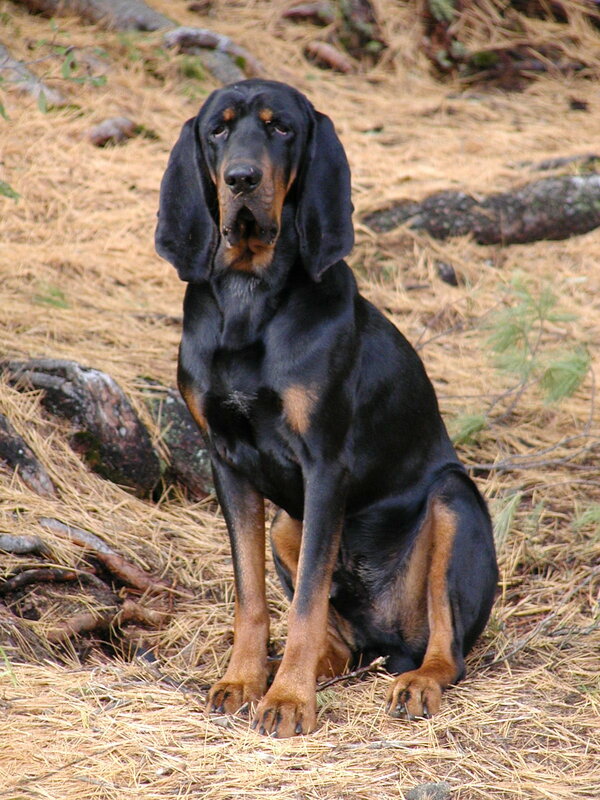 Coonhounds are hunting dogs that can take care of business when used for hunting, if properly trained. Also, they are great companions and can be at ease during downtime. They are very charming dogs especially with kids and other dogs. According to the American Kennel Club (which focus on show dogs) ranked them 91st. The United Kennel Club (which focus on working dogs) ranked them 5th. These animals are extremely clam and tolerant of children. They can become great “homebody” dogs and companions. Though, they can become bored with the un-dominant approach of children. They are more playful attentive with children when they are puppies. When training, you need to be determined and vigilant. These dogs can become stubborn and unresponsive if not properly stimulated or dominated in their training. You need to be strict with repetition and consistent, but also supportive with care. They can get frustrated with aggressive treatment and weak training. Patience is a virtue that should be adopted when training. The payoff is positive! These dogs don’t have many behavioral issues. If anything there are very persistant dogs when picking up a scent. It is difficult to get them off of it. They will follow the scent until they capture the “prey”. Coonhounds do need to be leashed because they will runoff until they get there scent satisfied, which could lead them to getting lost. Most often Coonhounds are food driven. Food will get you your best results when training. Often they can get labeled as “dumb” dogs because of this fact, but simply they are very focused, stubborn dogs that demand your authority. If you can’t affectively train them they will do their own thing. They need an experienced owner to train them. You do not want to practice with this type of dog. Coonhounds will not do tricks or obey a dozen different commands. Coonhounds for the most part are howlers. Your hunting buddy will howl along with the sirens of first responder vehicles. Because these animals are very friendly and active they do need active stimulation from an owner, child or a mission of scent. They do get lonely and will howl continuously if left alone for a long time. These dogs require a lot of nurturing and strict attention, if not they will totally be unresponsive. These dog love food! Be careful not to leave scraps or leftovers on the kitchen counter because they will scarf it down when you’re not looking. As an eating habit they should be fed twice a day with 2.5 to 5 cups of dry dog food. Divide that amount into the two meals. Be cautious of this amount because they will over eat. They are susceptible to obesity, especially if you are using treats to train them. You must pay close attention to their calorie consumption and weight level. This could make a huge difference in the Coonhounds overall health and hunting stamina. You have concerns about your dog’s weight consult your physician on the best diet for your hunting and running companion. This dog is a very distracted animal but firm responder to a dominant authority. When training, patience is a virtue that needs to be adopted by owner in order to properly and efficiently mold the behavior of the Coonhound. The owner must develop positive training methods and various repetition to get desired result. These dogs are very intelligent but can easily be distracted. Ideally food oriented treats are helpful in getting the behavior implemented. Do not shy away from their intensified sense of smell. If you welcome their natural tendencies you will have a better outcome when training. They will need to run a few miles a week, practice catching their sense and wandering to enhance their hunting talents. Because of the demands put on their body they must frequently practice their scent sense and trailing skills. Remember to be a dominant force when training them. These dogs mortality last anywhere from 10-12 years. They are considered healthy dogs. But they do have some consist health issues such as eye problems, ear cancer, hip dysplasia and ear issues. An average litter size for females is eight pups. The Talbot Hound, which inhabited England during the Middle Ages, roughly after the 1000s, are the direct predecessor of the Black and Tan Coonhound. They consists of six different Coonhounds, such as the Redbone Coonhound, Plott Hound, English Coonhound, Bluetick Coonhound, and the Treeing Walker Coonhound. They would not all be recognized until the 21st century. Foxhounds were brought to the Americas from Europe as hunting dogs. By the 17th century many wealthy English settlers brought these dogs to settlements, mainly in the south, to hunt “game”. This became a very important cultural characteristic for aristocrats and entrepreneurs. Though, breeding of the foxhound was a must, specifically because of the difference in environment from that of England to the American south. The biggest difference in the areas would be that of the temperature. A foxhound would typically over heat in the American south scorching climates compared to the very cool one in England. The American colonies at this time were still underdeveloped. Dogs in this setting would need to have more of a rugged build, tough exterior, thinner coat and quick mobility. The English foxhound would not be able to survive in a “quarry” or “game” activity. Over the next hundred years a cultivation of new hound breeds will be created throughout America. These breeds will be influenced by French, Irish, Scottish and Native American hunting dogs. Depending on need and functionality of hunting dogs, breeders developed several distinct dogs, which included the Virginia Foxhound, American Foxhound and Coonhound. 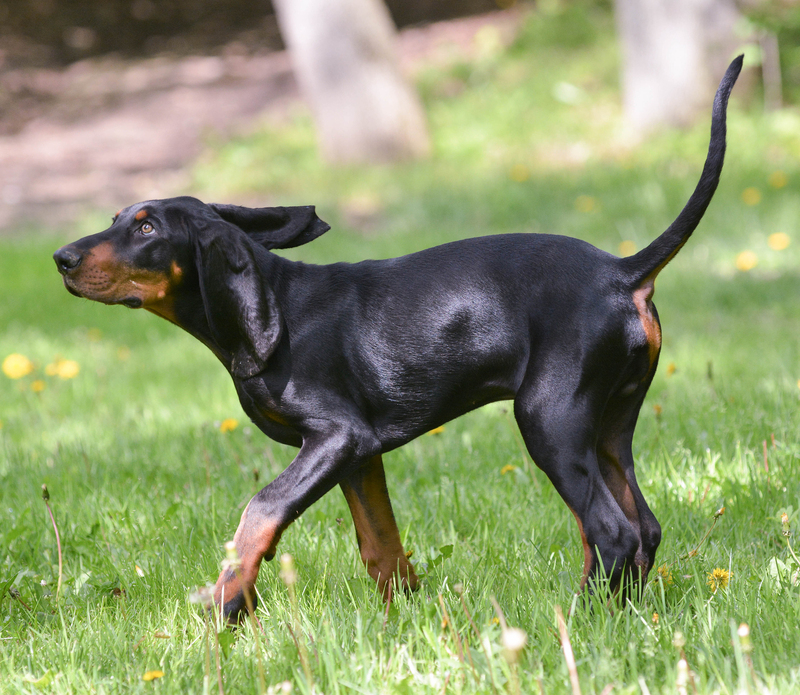 The Black and Tan Coonhound will be used mainly by American settlers, explorers and Native Americans. These dogs are direct descendants of English Foxhounds and bloodhounds. These dogs would be typically used to hunt rodent “quarry” such as raccoon, mainly for their pelt. This type of hunt requires the dog to be able to run far distances, get in and out of hard to reach places, jump in and out of water, a keen sense of smell and a determined stubbornness. These dogs are great to re-establish cold trails because of the keen sense of smell. They excuberate a lot of energy and are very outgoing. They are perfect for hunting and can be a comforting family dog. In either case they need to actively exercise to keep up their muscular build, conditioning and agility. They are considered to be a crossover between a Bloodhound and Black and Tan Virginia Foxhound.